Promo fares for trips on the remaining months of 2017 are still available! Read this latest airline promo as low as P599 select local routes and more sale tickets! Grab sale tickets for your trips from September 15-30, October, November, December 2017 from this current airline seat sale. Fly to new domestic routes for only P599: Cagayan De Oro to Boracay or Dumaguete and Clark to Kalibo. Other local destinations sale tickets are as low as P799 from Cagayan, Cebu or Davao; P1,799 and P2,299 from Manila station. International promo fares start at P2,599 for popular tourist destinations: Singapore, Bangkok, Ho Chi Minh, Beijing, Busan and Shanghai. Fly to Nagoya, Narita or Osaka for only P3,899. Dubai and Sydney sale tickets are also up for booking from Manila or from other Philippine cities. Interested? Do not take so long to decide. Tickets on sale are limited and may not be available on all flights. Book or buy the affordable Cebu Pacific fast! Cebu Pacific low fares are great for one-way travel. Ticket rates cover free 7 kilos cabin bag, base fares, Web Admin Fee and taxes & fees. If you want to get roundtrip ticket, check promo ticket promo availability for your route. 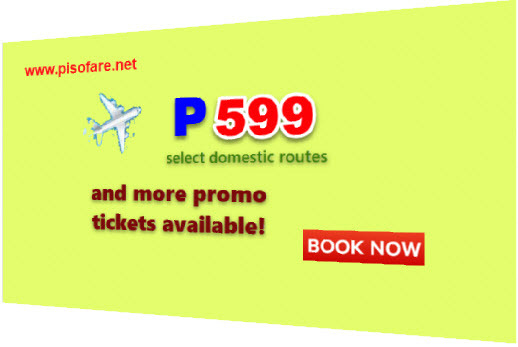 Availing the promo fare may be done by online booking at www.cebupacificair.com. Access their website, select your city of origin (from); then your destination (to), your departure and return travel dates, select number of passenger and click search. No Promo code needed for booking. Here is a GUIDE IN BOOKING ONLINE Cebu Pacific Promo Ticket for your reference. Buying the Cebu Pacific sale tickets at the airline ticket offices, booking offices and travel agents is another way of getting the low fares. You don’t want to book online or visit the ticketing offices? Then, call the airline hotline in Manila (02) 702 0888 or in Cebu (032) 230 8888 and book thru their Customer Service Reps.
Fares booked online can be paid via these payment options: 1) credit cards and online payment, 2) Payment Centers where you should pay before 12 midnight on date of booking, and 3) Payment Centers where you must pay within 24 hours from booking time. So, where would you like to head first? You may get promo tickets for your Christmas holidays on this seat sale. Don’t wait for the last booking day, book the low fares now! For more Cebu Pacific Air, Philippine Airlines, Air Asia and other airlines promo fares 2017 to 2018, PISO FARE and travel updates, LIKE and FOLLOW us in Facebook: PISO FARE TICKET!! !